Thanks to poet Jacqueline Valencia for this review on Goodreads of my latest book Don't Let It End Like This Tell Them I Said Something (ECW Press, 2014). Postmodernism finds poetry continually cycling through arguments of the lyrical versus the conceptual. Therefore, it’s refreshing to see a poet dare to play amongst the mudslinging. 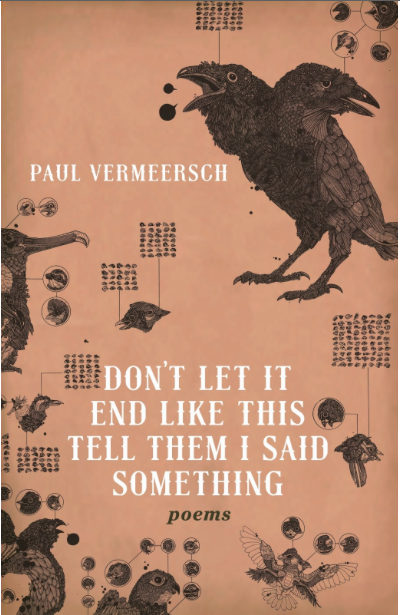 Paul Vermeersch’s latest poetry collection Don’t Let It End Like This Tell Them I Said Something, is an ode to language left after the end of civilization. Scouring the poetic landscape with various prose harvesting methods such as cut-ups, centos and erasures, Vermeersch collects work and molds it into new structures. He does this on the conceptual setting of future decay. Through that world Vermeersch renders the words anew and reveals the inherent experimental nature of poetry.